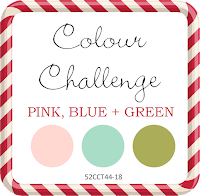 The 52 Christmas Card Throwdown Design Team has a Colour Challenge – Pink, Blue, and Green. I used one of my favourite digi stamps called, “Hangin’ with my Gnomies”, by Whimsey Doodles. I coloured the gnomes in pinks, backed it in blues, add blue snowflakes, and pretty pastel ornament paper from Kaisercraft. Please join us each week, and we will help you build your Christmas Card stash.